Frosty and a super fast Goldie! Having recently moved back to the UK, my first priority (after copious amounts of coffee) was to find some chickens! This was done very quickly, and a lovely couple came from Horncastle with our first four ladies, already at point of lay. A term used for chickens that are laying or just about to start laying. Perfect! They were quickly installed into the new, and very expensive, chicken coop, that apparently could hold up to nine chickens. I can only assume that the manufacturer of this structure was referring to chicks and not fully grown point of lays, as my four ladies (Goldie, Frost, Blue, Cee Cee) seemed very squashed in there. So we quickly converted the brick “shed” into a coop and allowed them complete free range on our whole garden! We were not disappointed, as they started laying the next day, and have not stopped since. 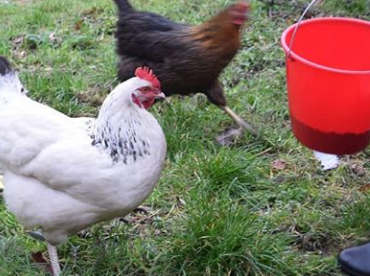 Thankfully, we live in a small village and everyone knows everyone, so it was not long before people were knocking on our door asking for some eggs, to the point were we needed to increase the flock to keep up with egg demand! There is plenty of room for more, and even though we did grow from four to seven in numbers, there is still lots of space left. Perhaps in the Spring or Summer we will introduce even more. For now though, our newest members, Snowball, Sponge and Sparkle, are all settling in well, and Snowball i s already laying her lovely white eggs for us. Sponge and Sparkle are still babies, but come Easter time, or not long after, they will be laying for us, and hopefully blue and olive coloured eggs. Exciting!! Until then, it is time to start sowing some seeds for the vegetable patch, dig in the manure on the allotment, and start looking for some new nest boxes for the ladies so we can make their “shed” more comfortable.